30.06.2017 Day Zero- and we are in Saint Petersburg. In the airport there are taxi touts hovering around where passengers arrive. We ask what the price is and decline it. A walk along the airport building to a young man by a sign advertising an airport taxi. Half the price and in line with what we read before we set off from the UK. Already we feel like savvy travellers. 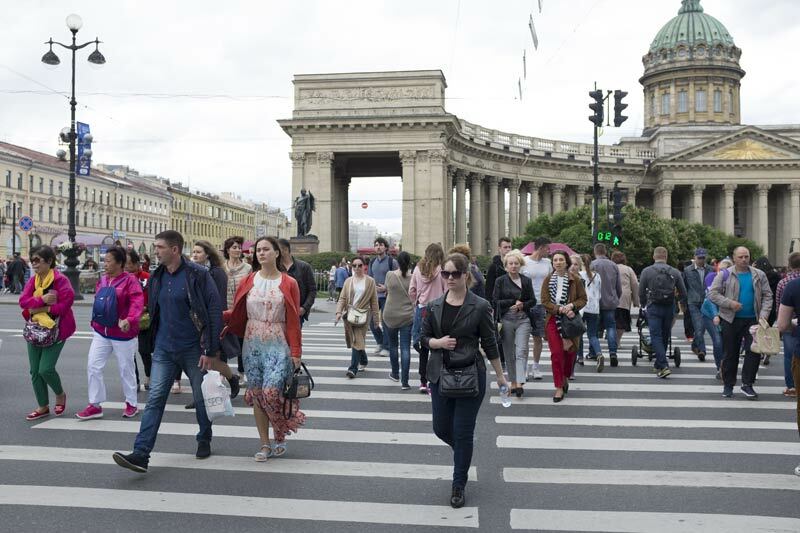 Into the hotel and then a walk up to Nevsky Prospect, which is broad and shades off into the distance. The metro station is circular and I recognise it from Google street view when I searched back in the UK. It was good to orient ourselves before we set off, but now I reflect on this and idly wonder whether there is anywhere that is off the beaten path anymore. Our hotel room is large and well decorated, but smells of paint – a kind of dusty, plastic smell. And the bathroom smells of the drains. 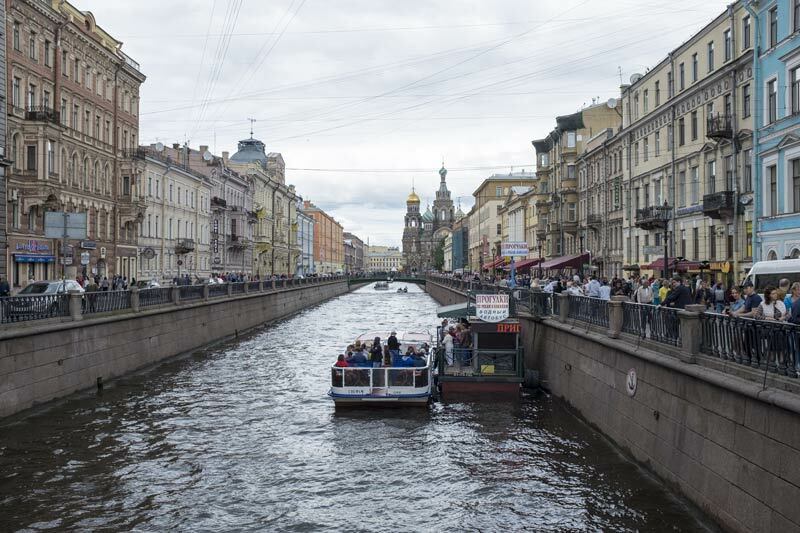 We read that Saint Petersburg has problems with its sewers. Giardia infections (giardiasis) are not unknown. There are three bottles of water in the room (and fresh ones every day), so the risk of giardiasis must be real. That said, we don’t hear of anyone who has problems. We call the staff and they send someone the next day to clear the smell from the system. It works for a few days and then comes back. The staff are friendly and we like them. Our first impression of Russians is positive. I go out and am confronted by a begging drunk on the corner of Vosstaniya and Nevsky Prospect. He stands leaning forward a few inches from my face and moves off when I shake my head. I had this idea that I would see a lot of drunks in Russia, but he is about the only one I see in all the time we are there. I am taken aback to see that Stockmann Department store is open until 11pm daily. A department store open until that time every day? 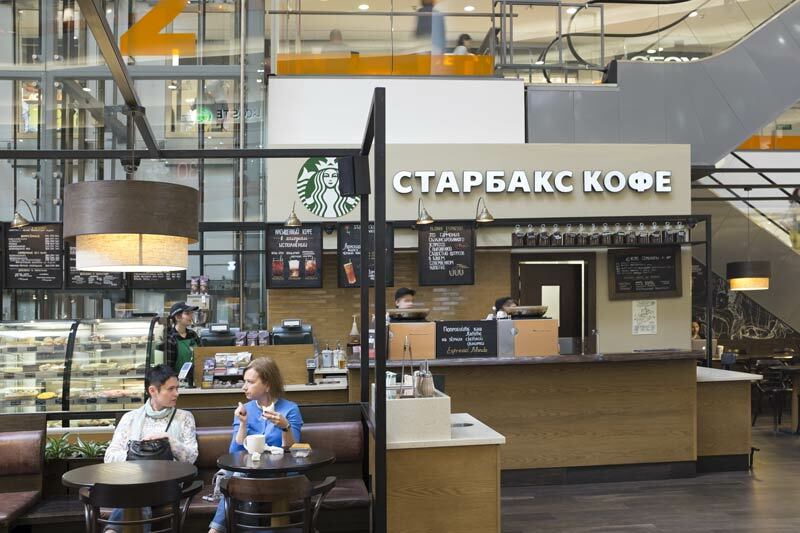 Stockmann’s links to a mall on several floors and there’s a Starbucks. Spot the Cyrillic alphabet. The second word is ‘cafe’. From our adventures in the Russian language before we left (YouTube videos) we learned that the letter ‘o’ is pronounced ‘o’ when the stress is on that syllable. But when the stress is on another syllable, then ”o’ is pronounced ‘a’. In our hotel room the film on TV is ‘Salt’ – an American film about Russian agents planted in the US. Dubbed in Russian – I wonder what the local audiences think of the film? We go into a couple of places and decide on one that serves Italian food. We talk with the waiter about literature and language. He tells us it costs a lot of money to live in Saint Petersburg, which is why he is working part time as a waiter. He is from the Urals (said, we think, with some reticence as though it is not a desirable place from which to come) and he is studying to become a neurosurgeon. After we leave the restaurant we smile at the recollection of a good conversation with the waiter. We say ‘Only in Russia’ does one meet a trainee neurosurgeon and talk about Dostoyevsky, Bulgakov, Nabakov, and others. It is nearing the end of the White Nights, the midsummer period when the sun hardly sets. Late at night we can see across the street as easily as if it were daytime. It’s a lovely feeling in a grand old city. What do we notice? Ripped jeans, black chokers, spinners – how do these ideas spread worldwide so quickly? Tamara notices that quite a few women have very long hair stretching down their backs. And many have their hair in braids. We think braids must be a Russian style. Later we see tourists from other countries with the same style. Is it Russian then, or just the latest world fashion that has spread here? We play a game of deciphering the Cyrillic names on the shop fronts. We get excited when a word jumps out at us. We go to the famous Cafe Singer – a bookshop with cafe. After exhausting ourselves among the bookshelves we go to the cafe and eat a chewy, doughy Danish. Unhappy, we order more food. This time we order wisely and eat good smoked salmon. Across the road there is the huge frontage of the Kazan Cathedral. We cross to the Kazan cathedral and wander around inside its massive interior and sit next to an older woman. I notice that she magically moved seats to allow Tamara and me to sit together. The ‘magic’ element is that she moved before she saw Tamara. Did I look like someone who was with someone else? We exchange nice smiles with her when we leave. One note of interest is that we learn later that the Kazan cathedral features in Dostoyevsky’s Crime and Punishment. 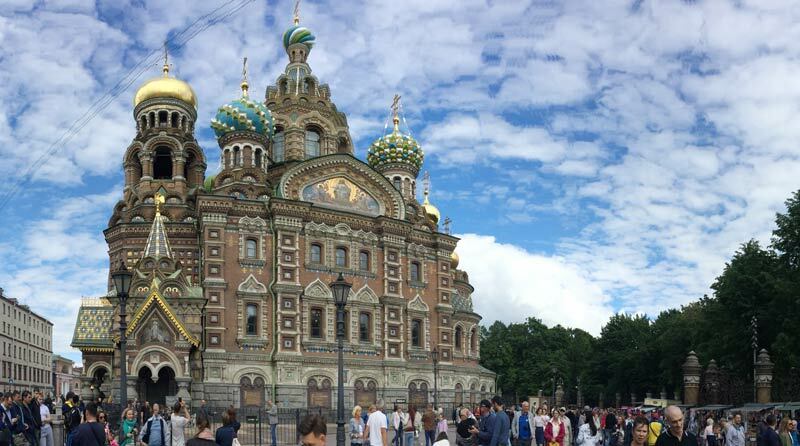 We walk up the street by the side of the canal to the Church Of The Spilled Blood. It was built in the site where Alexander II was assassinated. We reflect on how world events turn on small aspects of human character. The assassins threw a bomb at his armoured carriage and succeeded only in hurting some people who were nearby. Alexander got out of the carriage to see what was going on and that is when the second bomb killed him. The seeds of the Russian Revolutions can be traced through this event. We don’t go in to the church, deciding to leave that for another day. It is magnificent from the outside as we walk around it staring upwards. Outside the Ploschad Vosstaniya metro there is a man with a raccoon around his shoulders, handing out tickets (the man, not the raccoon). We stroke the raccoon and discover that its fur is strong like horsehair- not like a cat. He tells us he has six raccoons in his apartment and feeds them dog food. I go out to pick up a sandwich at Stockman’s cafe in the mall and the young woman who serves me looks like she is from Central Asia. She bright and quick and speaks good English and she tells me she is doing a Masters in BioEngineering. Another student working part time to make ends meet. The buffet breakfasts in the hotel are magnificent. The mix of guests is interesting, with people who look like they could be from Iran or Turkey, and others from Central Asia. 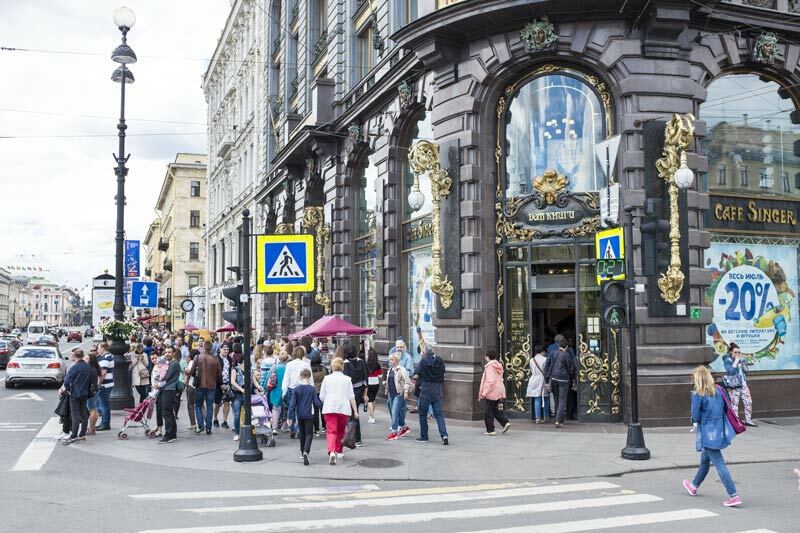 Out of the hotel and a metro along Nevsky Prospect where we take a boat tour along the canals. We choose to go with Anglotourism (commentary in English). We arrive late at the jetty to buy tickets and it is a mad rush while we try to find out where Anglotourism leaves from, which is their ticket office, and how to get down to the boat. I am not handling it well and part with the cash with the air of a man not expecting to receive what he has paid for. In fact the tour is excellent. The boat threads its way around the concentric canals and under bridges, working its way towards the old centre of the city. We go under the Bridge of Singers and the Three Bridges of Centuries. The views of the twists in the canals and the old buildings lining them are lovely. The bridges are low and we have to lower our heads so as not to whack ourselves against the ironwork. One of the bridges is so low that the boat barely scrapes under it. We see the Mariinsky Theatre ahead of us. We have tickets for a performance of Prince Igor at the Mariinsky later in the week, so as we pass under the bridge we look up at ‘our’ theatre. And then we are out and into the open water and the broad mouth of the Gulf Of Finland with impressive views across the gulf to the fortress on the islands across the gulf. People are sunbathing on the stony shore by the fortress. In this climate we see that people need to grab every drop of sunshine. Good commentary from the guide, Maria. As we pass some merchants buildings she mentions that the god Mercury did additional duty as the god of commerce. She tells us that Mercury’s entwined snakes are on many commercial buildings including the ‘profit houses’ – the 18th century apartment buildings that were rented out to the poor of the city. Contemporary writers wrote about the overcrowding and unsanitary conditions of the apartments, and they were a national scandal that went on for years. Back on land we find a small cafeteria and eat kacha and spinach cake with vegetables. 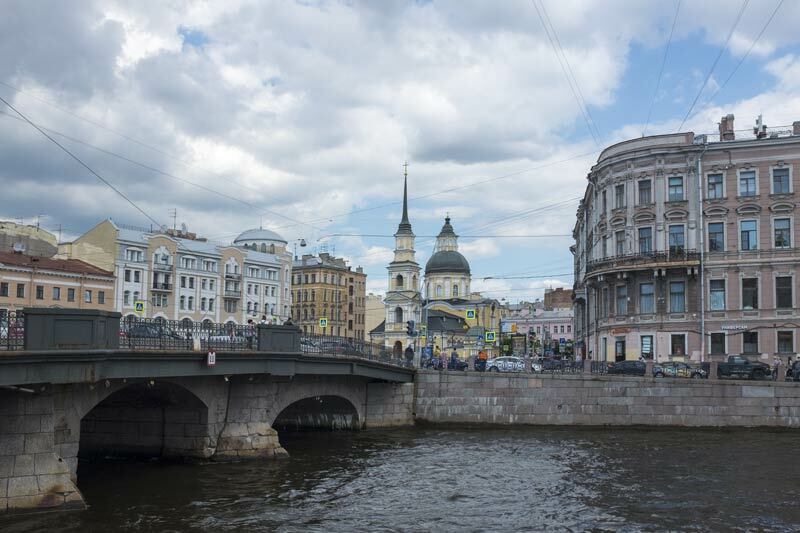 Tamara jokes that eating in Russia is like being at a Jewish wedding or bar mitzvah – it’s the same food. Then on to the Museum of the Siege of Leningrad. A raggedy building with good art on the walls. Half a million dead in a 900-day siege. There is a terrible authenticity to the exhibits. I stand stock still in front of an SS officer’s uniform and spit quietly. Afterwards, we sit in the Summer Garden of the Imperial Palace and watch the people. It feels good to be here. We walk and get tired. We catch a bus 90-K. In the bus I think it is more like what I had thought of as Russia nowadays – poorer under the glitz. I could have stayed on the bus all day just absorbing the tone of the people. Latitudes around the world continually surprise me. Canada is ‘in the north’ – at least it seems so because of its climate – but St. John is only 45˙ north. That’s further south than Paris! Yes, if I start swimming here, I’d end up in Bordeaux. 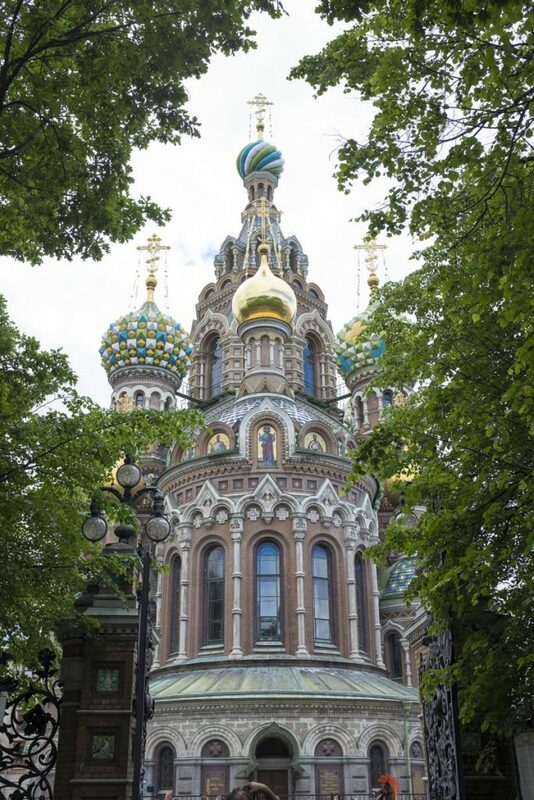 We were in St. Petersburg last year but for only three days. It is too much to take in, although we have some wonderful memories. The white nights are available to us every year here in the North of Scotland. In midsummer, we have about an hour of darkness. The downside is that the grass grows like crazy, and you need to cut it every week. Thanks for writing about your experiences. Really good to know that you enjoyed it so much. We found that although it was good to see it once – to wonder and to marvel- it is not a place to which we would choose to return. The Dordogne Valley is my choice for natural wonder. From spectacular engineering to historic caves and unbelievable local honesty, I have found nothing that comes close. Thank you for your comment. Ah, the north of Scotland – then you are at almost the same latitude as Saint Petersburg! I too like the Dordogne region, although it is a longish while since I was there. Also the Lot-et-Garonne region a bit further south west. Have you been there? If not, I recommend it too. It was wonderful to be there with you, m’dear!